I have always loved being a dive instructor and thoroughly enjoyed running a dive school and centre. 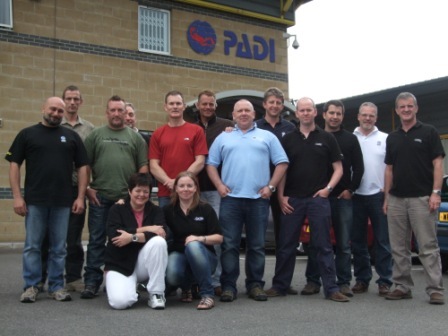 18 months ago, however, I had the opportunity to join PADI as part of the training team here in Bristol. By January, the first draft of the PADI Recreational Rebreather courses had been written and was well into the review period. During this time internal staff, like me, and external experts review the courses. This is a major job for both the reviewers (these are pretty meaty courses) and for the writers who have to check the reviews and tweak the courses where necessary. Just as I thought there wasn’t much more to do, we had our first interdepartmental meeting and I realised the work had barely begun. Having very little experience of a large company I had been focused on my own job and hadn’t realised how many other people would need to be involved. Our project manager put together time lines to coordinate the development and production of the course materials the marketing team set their goals and agenda, I.T work out how to make it all happen electronically, photo, video, art departments start their planning….well you get the idea. Being mostly involved with the product development I learned that each product had to be designed or written, reviewed for content (usually more than once), laid out, reviewed for layout plus a final check to make sure everything was tickety boo! Of course this is repeated for every product, for every course. The rebreather courses are the biggest project PADI has ever undertaken; five major courses all launching one after another. It isn’t finished yet but we are well on the way and I am learning more and more every day. 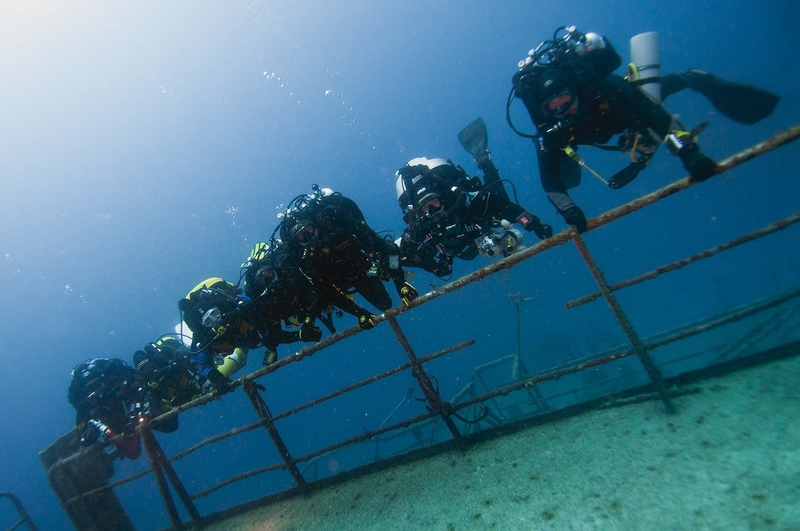 Although we had already been in contact with several rebreather manufacturers, February’s plan was for Mark Caney, Karl Shreeves and I to spend a week in the Red Sea with representatives from some of the manufacturers. We had two purposes; to learn as much as possible from the manufacturers about their products, their latest and forth coming changes and also to get some of the many photos we need for course materials and marketing. Problems in Egypt meant that we had to change our plans at the last minute and we quickly cobbled together a new plan with the help of Divewise,Malta. Maltain February was not quite as sunny as the Red Sea but I was delighted because this was my first visit toMalta. The teams quickly gelled and we had a very productive week with some lovely dives and correspondingly good photos. February and March also saw the first BETA tests get underway. PADI staff in each office were involved both in teaching and being students on some of the first courses plus external BETA tests, which is a normal part of our course development and testing. Running an actual program was fantastic as I got to see the course actually doing what it is designed to do – teach people to dive rebreathers! Inhouse training is ongoing as we ensure that our staff learn all about the courses and rebreather diving to help them help you when the courses are launched. The end of March seemed to be focused around Dive Shows, planning future Tec Xplor events and attending LIDS where there was also a tec show. We focused on TecRec and rebreathers with three of us giving talks at the Tek Conference and in our own PADI village. Enthusiasm amongst our members was brimming over and the atmosphere was exciting and full of anticipation. In April I had a change of focus for a few weeks. 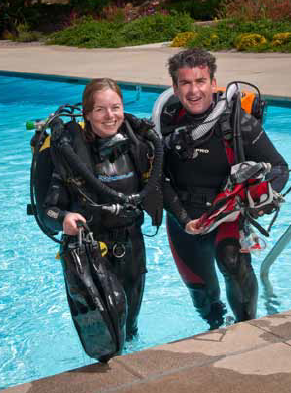 I was lucky enough to be on the examiner training course at PADI HQ inCalifornia. PADI Staff from Asia Pacific joined us for a truly global fortnight. As well as training to do a job I have dreamed of for many years I had the chance to meet colleagues I haven’t seen for a while and some I had only ever spoken to or emailed which was brilliant! Part of the training is like an internship, working with and learning from experienced PADI Examiners during which I had the chance to finally dive at Catalina Island as well as make my first (flying) visit toTexas, which was greener than I thought it would be. The PADI family is a strong one and Pat and Mal Fousek, who have worked for PADI for over 20 years, made a 4 hour drive to visit us at the IE. The final week of my month in California was a return to rebreathers; a video and photo shoot for the recreational courses. I turned up on day one to find PADI’s production team set up and ready to go! PADI produce several videos and goodness knows how many photos each year and have a professional production team on staff who have won many awards for their work. Throughout the week my job varied from rebreather assembly and maintenance, training expert (it’s easy to forget a critical attribute when you do the skill ten times so the training expert is there to spot problems), and inwater model. There was even the occasional shot of me without dive kit on – eek! The first week was based around pool and land shots then we joined a live aboard, Sundiver, to spend a week around Catalina Island. Whilst the boat accommodation isn’t luxurious it was comfortable and the food and staff were great. Performing skills for video underwater was the biggest challenge. Because the camera makes everyone look further apart the divers had to be, literally, touching each other to look like a buddy pair and the camera operator is not far away either. In the pool this is relatively easy but in open water with poor weather and a lot of water movement this was very challenging even for experienced rebreather divers. The boat and crew were amazing and found us sites to dive even when the winds blew and blew. Although we were focused on work we got a small glimpse of the wonderful wildlife around Catalina, from its infamous Garibaldi fish to seals, sealions, dolphins and even a whale sighted just off the side of the boat. After a month away, doing such exciting things I wondered whether coming home might seem rather mundane but no sooner was I back than I switched to examiner mode for my first UK IE in Bristol, followed by helping to run a TecRec Instructor Trainer program at our Bristol offices. This was quickly followed by a trip to Wales for Tec Xplor. On a weekend with horrible weather on small island off the North Coast of Wales the true diving spirit shone forth as divers signed up for rebreather and sidemount try dives and heard presentations on TecRec, Rebreathers, Cave Diving and Sidemount by some of the UK’s top tec diving instructors all of whom are PADI TecRec Instructor Trainers! June saw me taking a week’s holiday to visit my parents. The “downtime” was very welcome and I came back refreshed and eager for more challenges. Back in the office and it was great to see that the recreational rebreather courses were reaching the stage of final checks and off to production. Tec CCR courses continue at various stages of development and I spent a couple of weeks writing and reviewing. Halfway through June we started a new project, Sidemount Diver. Whilst this is a smaller project than the rebreather courses it is by no means less important and I was delighted to be part of the team who will develop this program. In the first week of July we conducted inhouse training for the staff who will launch the rebreather programs and train the first batch of PADI Rebreather Instructors. As very experienced CCR and SCR Instructor Trainers, each on many rebreathers, our job was to familiarise them with our courses, give them the chance to practice conducting the launch programs as well as cover staff training. We also had help from several manufacturers who came along to make sure our designated ITs have the very best knowledge of their products. It was a very intensive week but we were delighted with the results! Inhouse training has been in focus as well with me enjoying introducing staff to rebreathers and sidemount as well as developing those already qualified to higher levels. This is a continual process for all types of diving. PADI staff do not teach commercially (to avoid competing with our members) but inhouse training is well subscribed to, both at student and instructor level, with a full range of recreational, technical and professional courses taught each year. In fact, later today I will be one of the CDs teaching an IDC. So, we are now more than halfway through the year and the most exciting part is yet to come. At the beginning of August I head off to California again to work on the photo shoot for Tec 40 CCR. Then back home for the final push towards the launch of the recreational rebreather courses followed by Sidemount Diver, then a couple of months later by Tec 40 CCR. Tec 60 CCR and Tec 100 CCR follow at similar intervals. There are certainly plenty of challenges but also tons of excitement and variety plus the opportunity to learn from the best in the business. I really can’t think of anything I would rather be doing which is why I think I have the best diving job in the world!